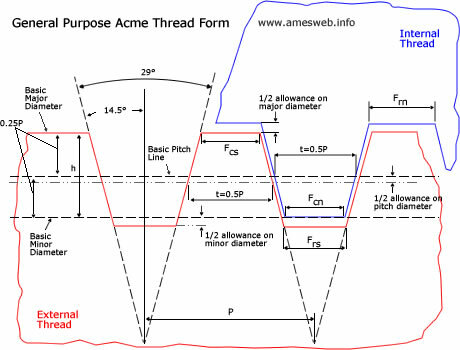 Internal ACME thread dimensions are given in the following chart per ASME/ANSI B1.5 standard for general purpose single-start ACME threads. Tolerance classes for ACME threads are 2G, 3G, and 4G and 2G is the preferred tolerance class. ACME thread angle is 29°. Tap drill hole for ACME thread , drill selection shall be done to obtain a finished hole somewhere between maximum and minimum minor diameters. It shall be considered to be close to the maximum minor diameter to reduce the amount of material to be removed when tapping the thread. Design Profile: The shapes of the external and internal threads in which the limits of dimensions are applied. The thread form of General Purpose Acme Thread is given in the following figure. Major Diameter: The maximum diameter of a thread which is diameter of the crest of a male thread or root of a female thread. Minor Diameter: The minimum diameter of a thread which is diameter of the root of a male thread or crest of a female thread. Thread class: A classification system to classify the threads for interchangeability and manufacturability. 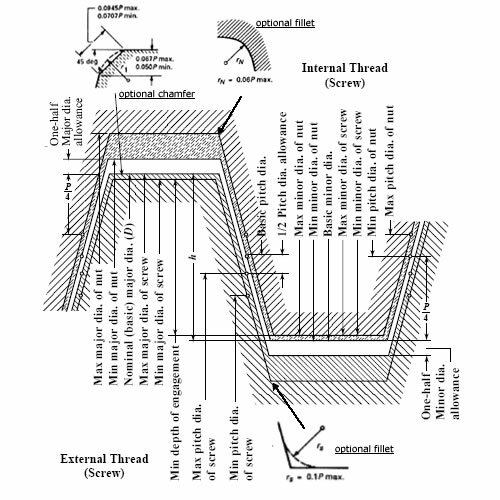 Threads per inch: Number of full thread per an inch length. Acme Thread Dimensions Calculator Calculator form of the ACME thread dimensions chart. External ACME Thread Dimensions Chart Tabulated form of the ACME thread dimensions calculator.